The Club began its life in 1989 as an offshoot of the Culter Leisure Programme, and many of its members were women who found they had time during the day after their children began primary school to take up hobbies such as hillwalking. These children have now fled the nest but some of those original members are still walking with the Club. With not too much hillwalking experience to hand, the Club drafted in Alan Crichton, who took them up Clachnaben and Lochnagar on the first two walks. However, by 1991, the Club Secretary, Val Street, found herself going on training weekends to learn more about the skills of mountain walking so that she could lead her fellow members herself. 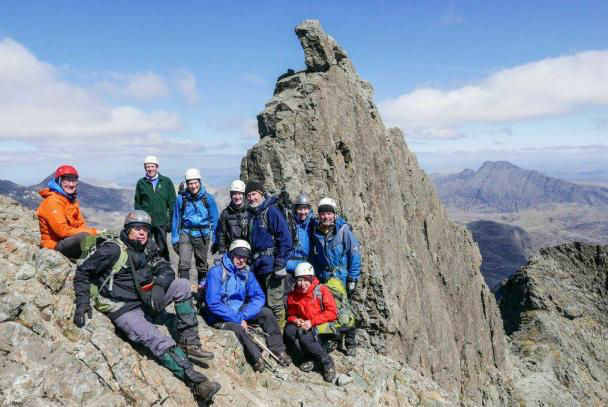 Eventually, other members of the Club gained confidence and knowledge of hillwalking so that the responsibility of "leading" walks was shared around and this is still the case. The Club has always walked on the first Sunday of each month, but over the last few years, Catherine Lacy has been co-coordinating a second walk each month, usually on the third Monday. This has proved very popular for those who don't necessarily want to walk at the weekend. Our walks in the winter are shorter, but in the summer, we organise a longer walk and a shorter one, and in these walks there are always a few Munros. And the membership has changed. Unfortunately, we all get older, and the general age of members has risen but so have the numbers of men joining, particularly when they retire, and the Club now has a more equitable ratio of men to women members. Apart from the 2 walks a month, the Club goes away for 3 weekends a year to mountainous regions usually in Scotland, although for the 20th celebration year, a group went for a lovely sunny week to Keswick for the Lake District Festival. And sometimes, when the weather is against us, we repeat the same venue the following year - this was so with our trip to Ben Cruachan and also our guided climb up the In Pin, both of which had very windy weather on the first attempt. Being a member of the Club gives walkers the opportunity to join others for additional activities too. A group of members completed the Tour de Mont Blanc last year and a walk in the Dolomites this year. We have to see what they come up with for 2017! We have recently developed a sparkling new website, (www.culterhillwalking.org.uk), including details of past walks and a calendar of future events and, to keep up with the times, we also have a Facebook page. This, we hope, gives the message that we are a small but very friendly Club and new members are always welcome.